This Christmas I will be mostly chillaxercising... including with my knitting! 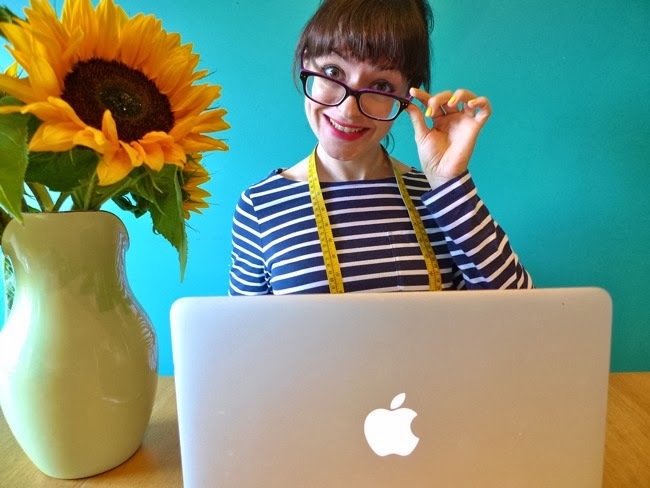 When I asked you for advice on how I should start knitting, I knew you'd be helpful, but I didn't expect quite so many amazing tips and generous offers of free lessons! 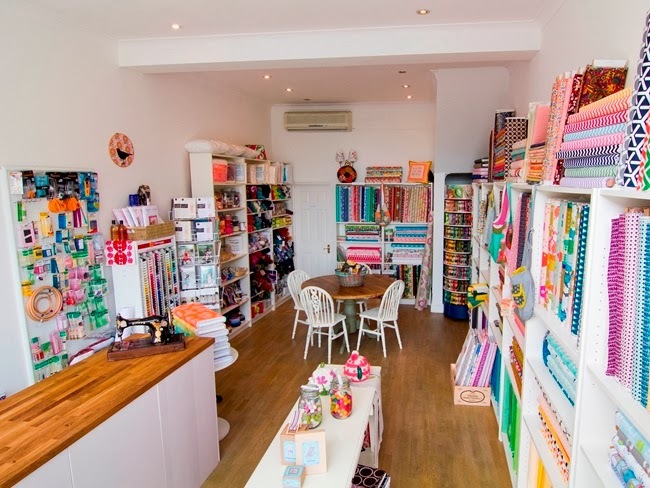 I would have loved to visit more of you, but in the end I went to Stepney for a lesson at the home of Aneeta Patel, author of the bestselling book Knitty Gritty which many of you recommended, along with the follow up book Knitty Gritty: The Next Steps. Aneeta was a fantastic teacher - clear, patient and down-to-earth. 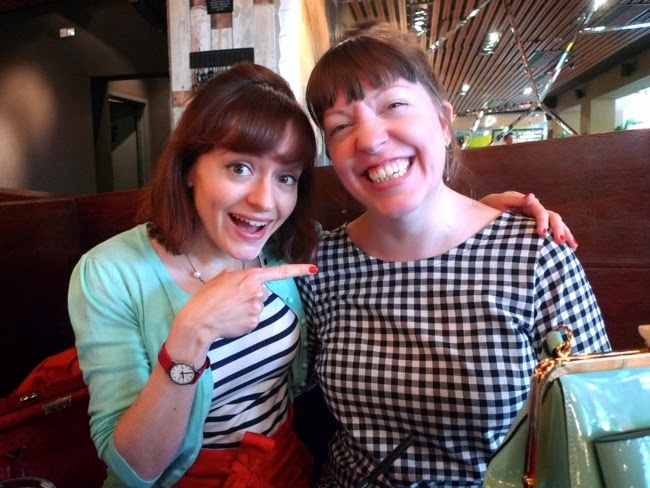 If you're looking to take a knitting class in London, I would definitely recommend paying her a visit. 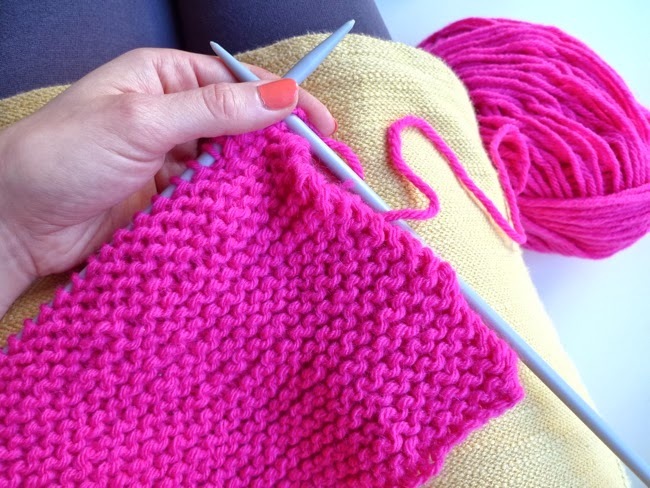 I've also just booked into the Knit Lab online video class on Craftsy, which looks great as you can see the teacher's knitting in action close-up while learning the essentials from the comfort of your own sofa. 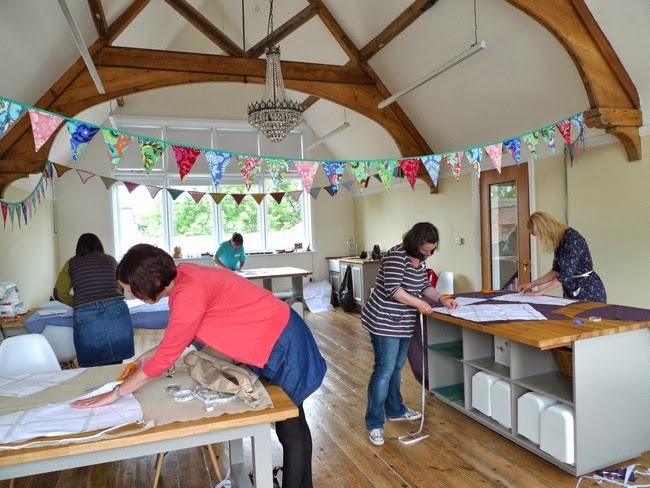 The class is on sale at the moment, along with loads of other classes in sewing, pattern making, knitting, photography etc if you fancy learning something new this Christmas or new year. 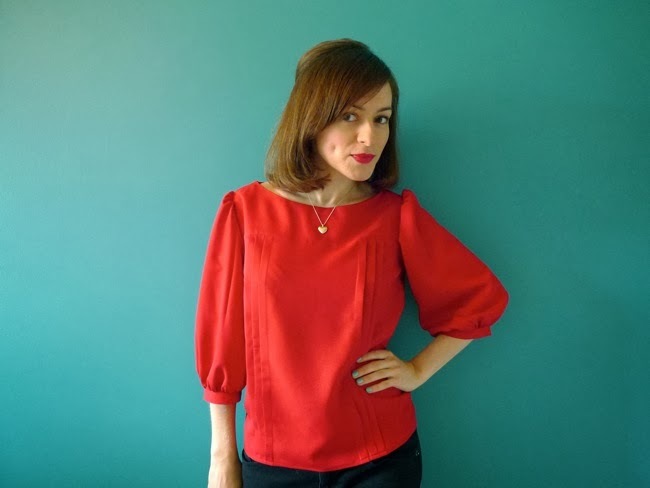 I'll also be curled up on the sofa sipping amaretto sours (classy), eating lebkuchen (mmm... I am getting through an average of 12 a day at the moment, yikes!) 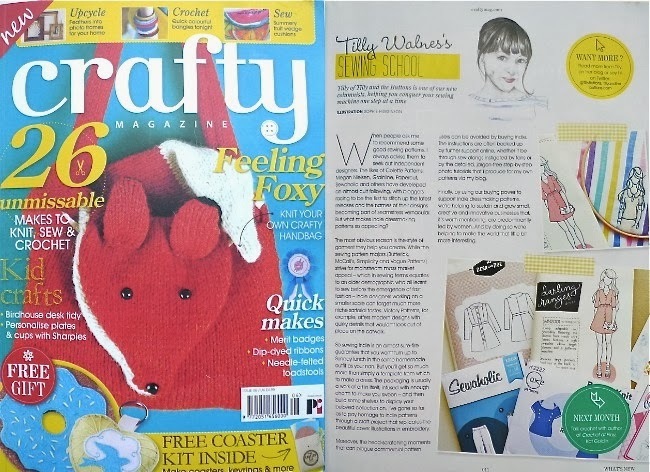 and reading the new issue of Crafty magazine. Ooh look, there's my column! This month I share some tips for beginners for diagnosing common causes of sewing machine strops. Well, I'm exhausted, so off to recline with my knitting. How will you be chillaxercising this Christmas? Wishing you a very merry one! Surprise! A little gift for you to say thank you for reading and for helping to make this a wonderful year - a free pattern and instructions to make a (fake) Fur Collar. 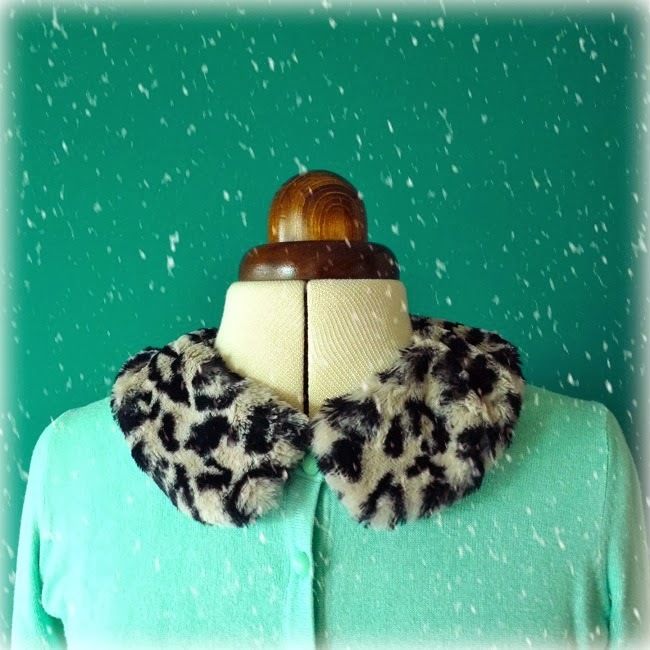 This is a one-size detachable collar to add a touch of Winter glamour to your coats and cardis. It'd make a gorgeous last-minute Christmas gift too! It can be sewn either by hand or on a sewing machine. The pattern is available below for instant download and prints on two sheets of A4 or Letter size paper. I made mine using a deliciously silky soft snow leopard print fake fur that I found in the remnant bin at Simply Fabrics in Brixton. 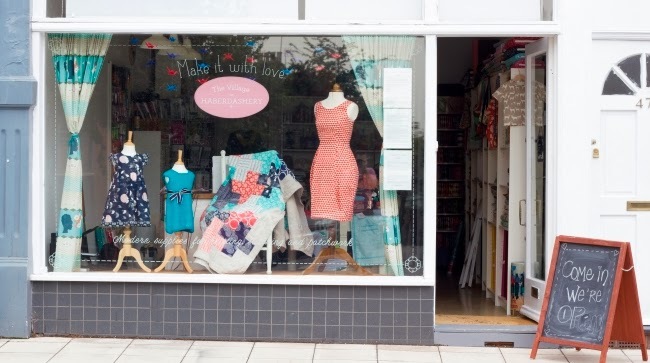 You could also try Fabric Mart, Minerva Crafts and My Fabric Place. 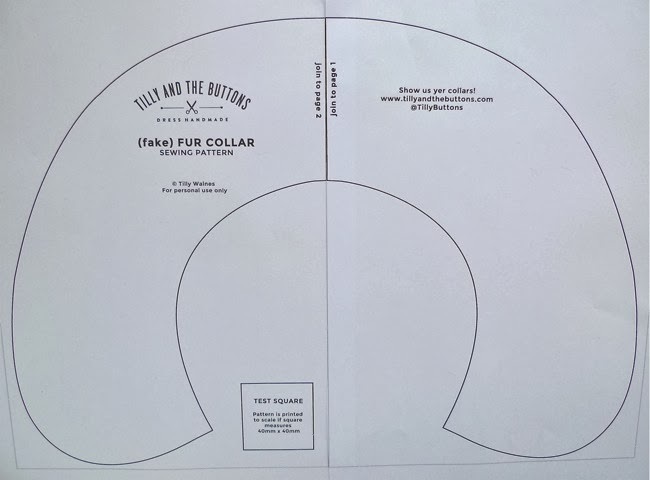 Download the pattern and open it on a PDF reader such as Adobe Reader (if you print the pattern directly from Google Drive, it may not print at full scale - not the end of the world but you may find the collar a little small). In the print settings, select “actual size” or “set scaling to 100%” or “turn off scaling” (depending on what options you're given) to print the pattern at full scale. When you've printed the pattern, measure the test square on the pattern to double check it's exactly 40mm. Cut along one of the frame lines, glue or tape the two collar pieces together to create one piece, and cut it out. And it's ready to use! 1) Place the pattern on the wrong side (ie. back) of the fake fur fabric, checking that the pile of the fur is pointing towards the ends of the collar. Pin the pattern in place, draw around it with a pen or pencil, then cut it out this shape using fabric scissors or a craft knife. 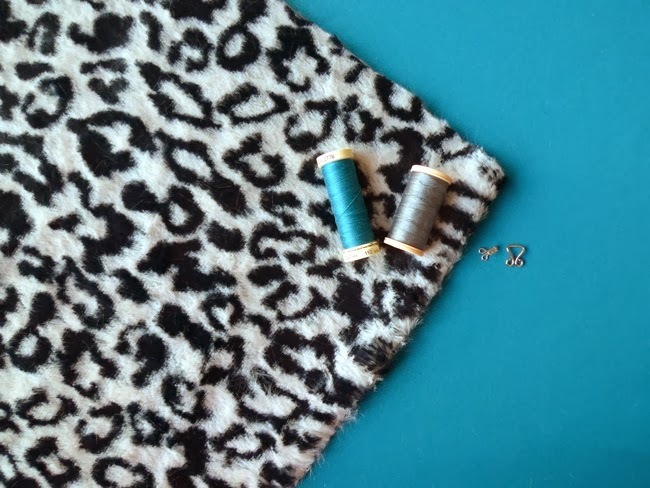 When cutting fur, use the tip of the scissors or knife to make shallow cuts – focus on cutting the backing and try to avoid trimming down the pile if you can. 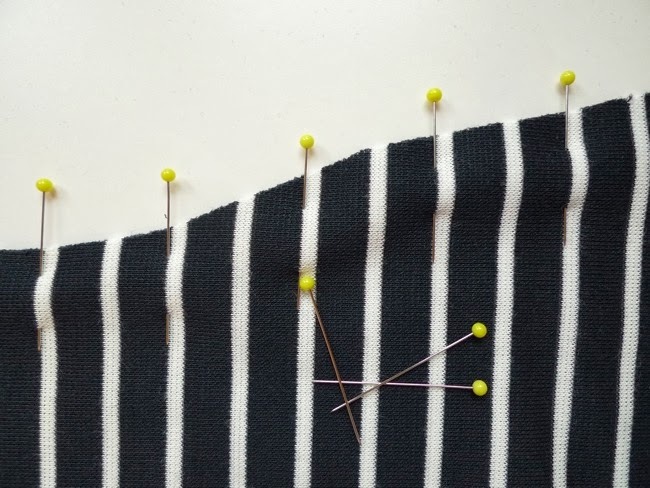 To avoid the pile getting caught in the sewing machine or creating excessive bulk under the seams, you can either carefully trim the outer edge of the pile (not the backing) or comb it towards the middle. By now you should have fluff everywhere! 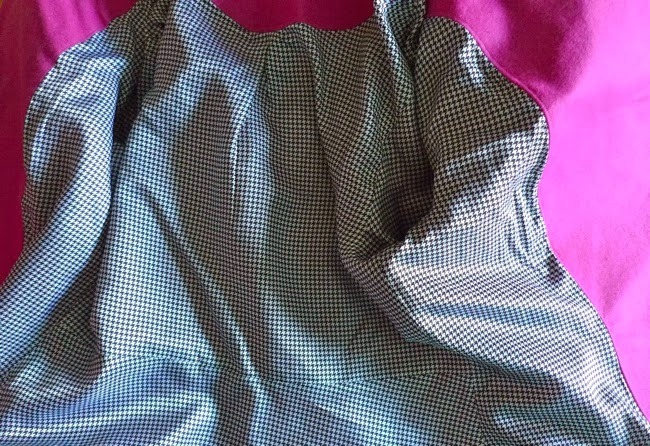 2) Pin the pattern to the under-collar fabric and cut it out using fabric scissors (or a rotary cutter if you have one). Trim the under-collar down by 2mm all the way around the edges. 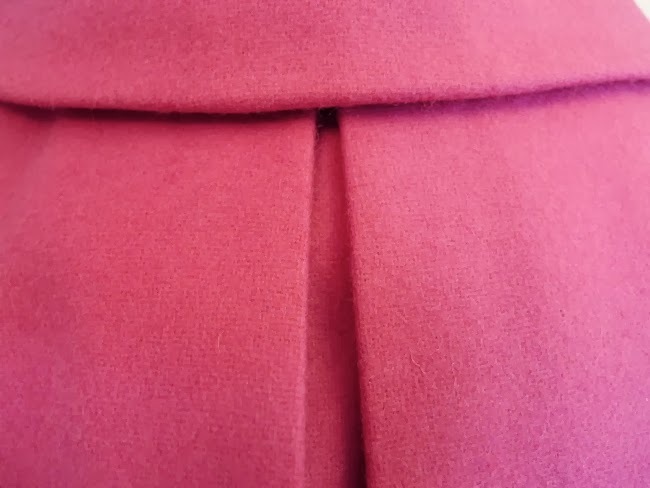 Making the under-collar slightly smaller than the collar will entice the seam line to roll to the underside when stitched so it’s not visible when the collar is worn. 3) Place the under-collar on top of the collar so the right sides (outside of the fabric) are facing each other. Pin the raw edges together, smoothing the pile towards the collar as you pin. 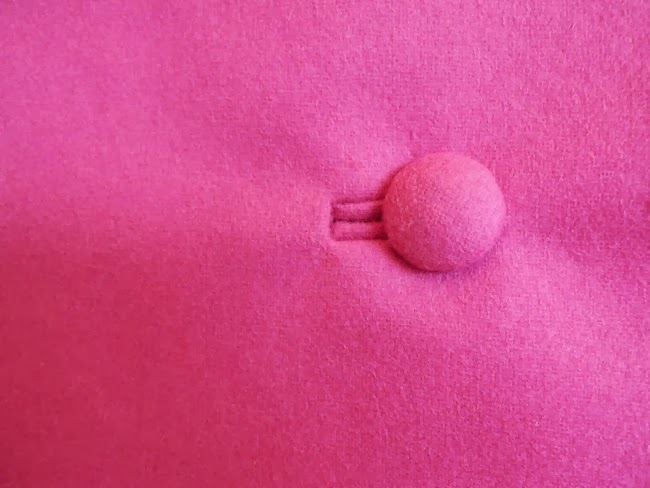 Leave an opening about 10cm / 4” in length at the centre of the inside edge – I like to mark each side of the opening with two pins to remind me to stop sewing here. It’ll probably look a little wibbly at this stage as the under-collar is pulling on the slightly larger collar fabric – rest assured it’ll be neater once it’s turned out. 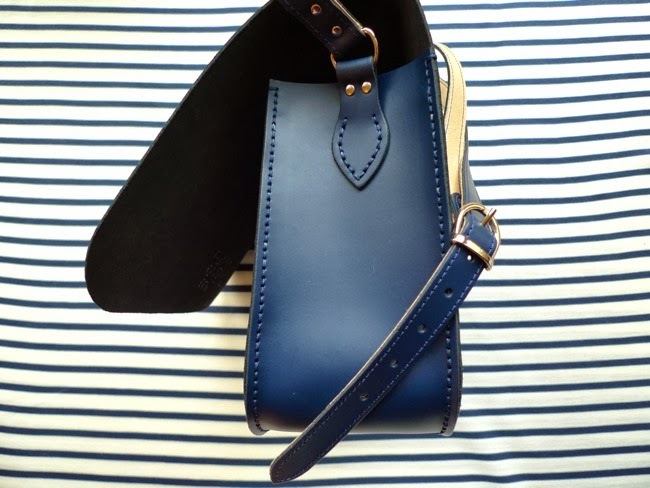 4) Starting at one end of the opening, stitch the under-collar to the collar using a 15mm / 5/8” seam allowance, backtacking at either end and removing pins as you sew. 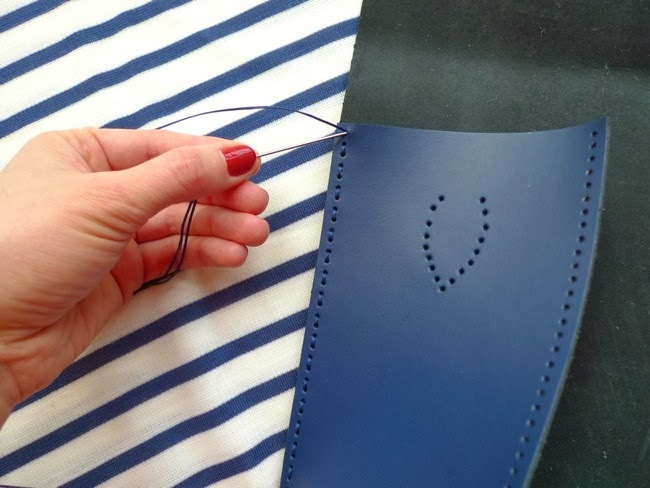 If you’re sewing on a machine, Claire Shaeffer’s Fabric Sewing Guide recommends setting the stitch length to 2.5 – 3mm. This makes it easier to free any trapped fur from the line of stitching later. In any case it’s a good idea to test out the stitch length and tension on a scrap first. 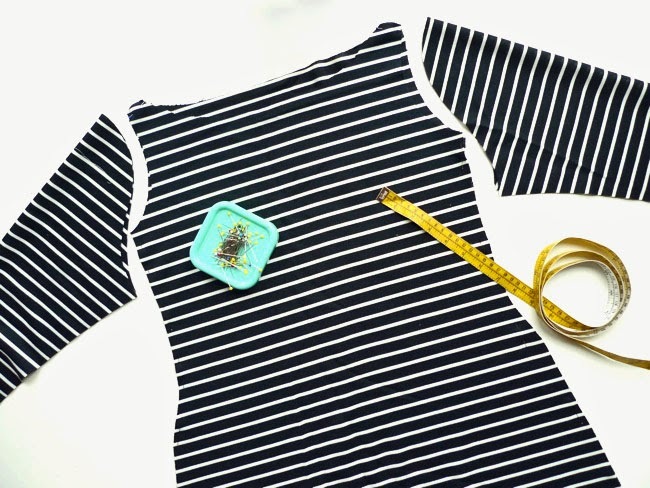 Take pauses as you sew to poke any stray pile towards the collar with a pin. 5) Trim the seam allowances down close to the seam line to reduce bulk when we turn the collar out. Don’t trim the seam allowances of the unstitched opening though. 6) Turn the collar right sides out by pulling the ends through the unstitched opening. 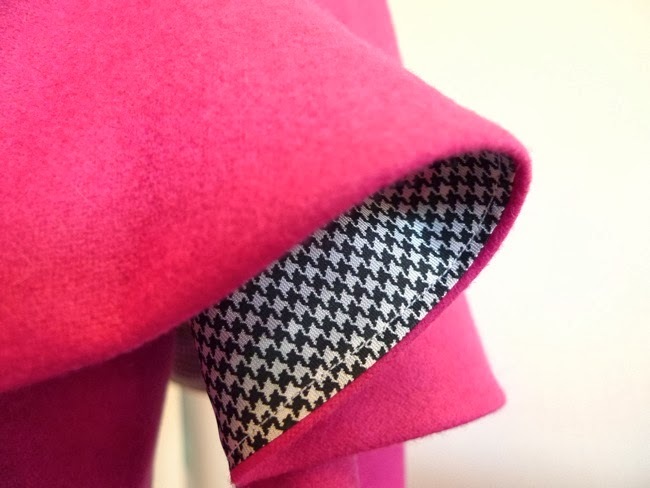 Run your finger inside the collar along the seam line to neaten it. If any of the pile is trapped in the stitching line, you can pull it out using a comb or your fingers. Fold the seam allowances of the unstitched opening to the inside of the collar and pin. Slip stitch the opening by hand to close it. 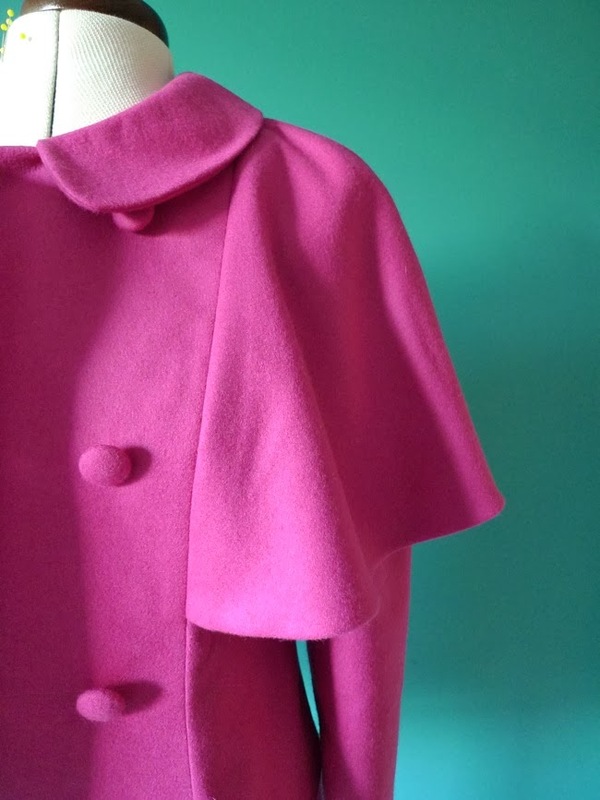 7) Sew a hook and eye onto the inner corners of the collar by hand. Et voilà! 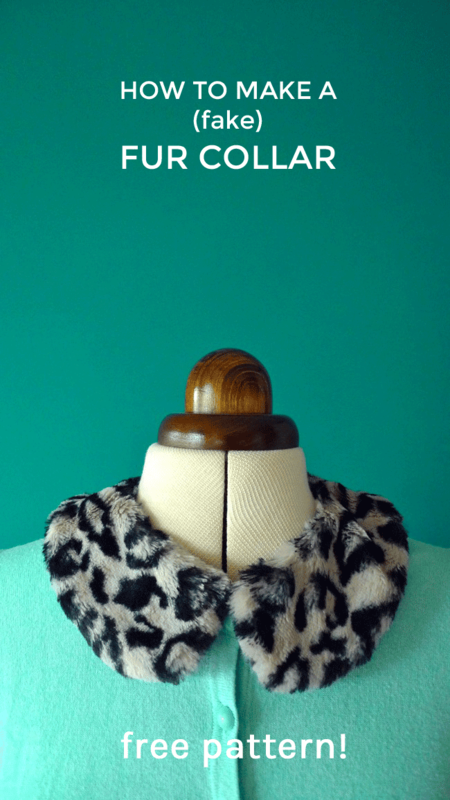 A gorgeous fake fur collar! You should now have fur fluff all over the place! Your table, floor, clothes, hair... When you’re cleaning up, give your machine a clean too so the fur doesn’t clog it up. If you make a (fake) Fur Collar of your own, I'd love to see! Leave a link below to your picture on Pinterest / Instagram / Flickr / your blog and I'll share it on Pinterest. I may feature some of the projects in a future post, so if you leave a link below I'll take that as permission to share your image. Can't wait to see! "Harvey wakes us up around 7am and we start the day with a cuddle. Then I get our breakfast ready so we can all sit down together to eat before Ed heads off to work. After breakfast I play with Harvey until his morning nap, when I have a little time to get myself ready and tick off some housekeeping chores like laundry and dishes. 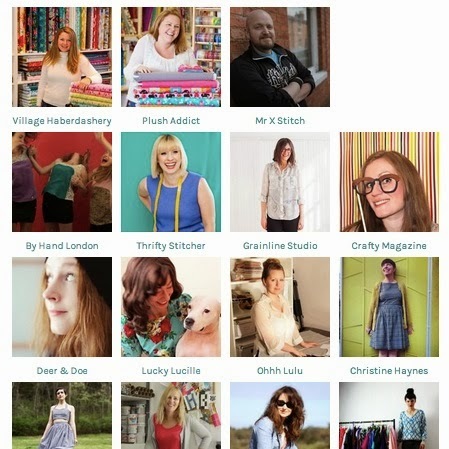 When I launched The Village Haberdashery online in February 2012 I was working full time and running the business from home in the evenings. 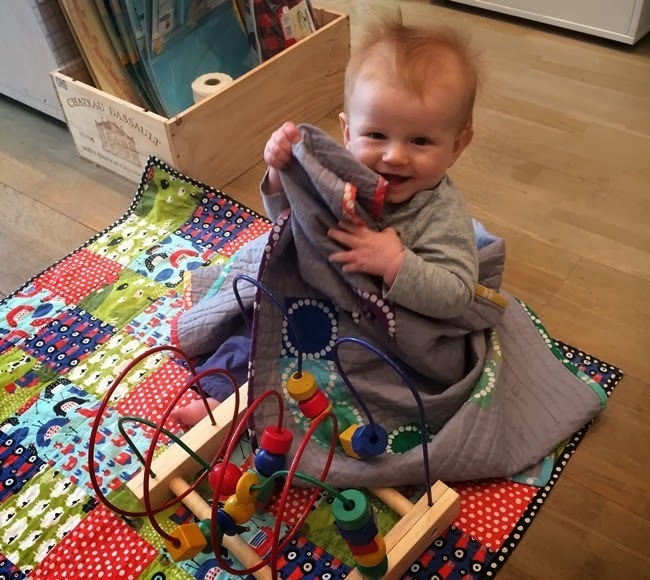 I was still working full time when we opened our bricks and mortar shop in West Hampstead last December so until Harvey was born I could only open the shop at weekends. Now, we’re open every day! After Harvey was born I hired an assistant, Caroline, who comes in four days a week. She handles most of the orders that come through the website, helps me with Harvey and makes it possible for me to take a day off once in a while – usually Sundays. The shop is just a few minutes’ walk from our flat so I pack Harvey up in a sling and leave right before 10am when we open. Harvey has come to work with me nearly every day of his life and he loves it in the shop. He is delighted by the customers, especially the children, and greets everyone with a huge smile. I opened the shop when I was pregnant so sometimes people stop in just to see him! I know it will be difficult to have him in the shop when he starts crawling, but we’re taking each stage (and its challenges) as it comes. Once we’re in the shop I catch up on email and then dive into my to do list. 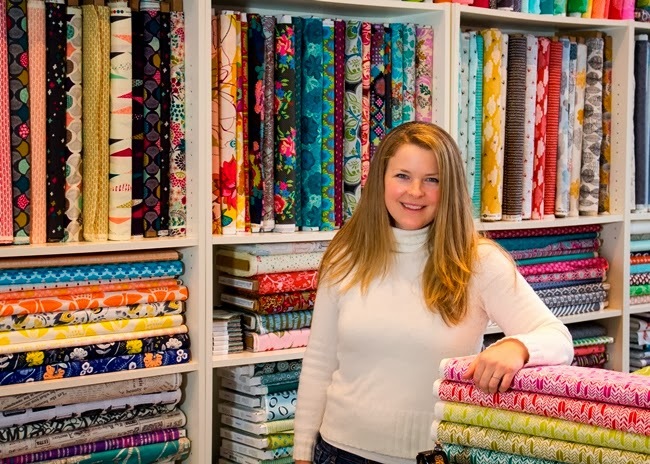 I choose every one of the thousands of products we have in the shop so a big part of my job is meeting with distributors, talking with designers, conducting customer surveys and reading blogs to get ideas so I can make good decisions. 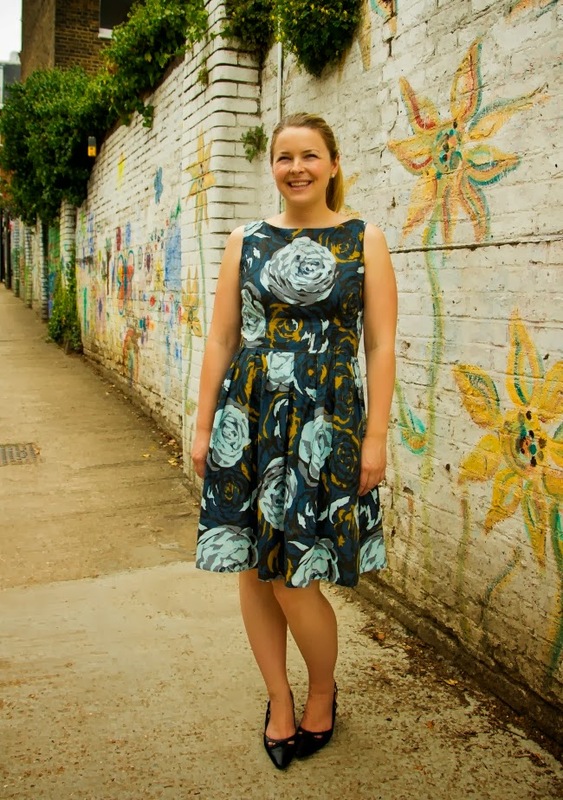 Since we opened the West Hampstead shop classes have been a really important part of our business, so I spend time working with our teachers to develop new classes and plan our schedule. 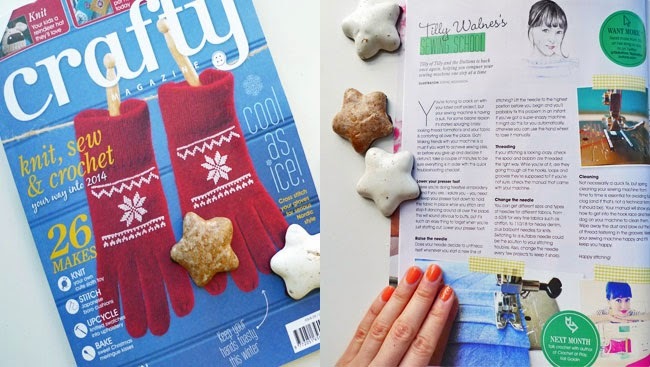 I also handle all of our marketing, which includes liaising with bloggers who create projects and tutorials for our website, writing our weekly newsletter, blogging and sharing day to day updates on Instagram and Twitter. Throughout the day deliveries of new fabric, patterns, notions and trims arrive and I add them to our product catalogue as quickly as possible. Harvey can usually be found playing on a quilt at my feet and I take short, frequent breaks to make sure he’s occupied and happy. We have lunch around 12:30. Harvey is eight months old but he still just fits into his Bumbo (a funny little baby chair) so I feed him on our table in the shop which is pretty entertaining for any customers who pop in around lunchtime! I usually just have something quick, like cheese and crackers. On Saturdays I treat myself to an egg and avocado or peanut butter and bacon sandwich from The Kitchen Table, the amazing café next door. When Caroline is in the shop I have a bit more flexibility so I try to plan meetings and errands for those days. For example on Tuesday I dropped Harvey off with Caroline in the shop at 10 and then made a quick trip to pick up last minute party supplies for our first birthday party. When I got back I met with a new teacher who proposed a class on printmaking and went over the details so we could book it into the schedule in February. After lunch I finalised our newsletter, which goes out every Wednesday. 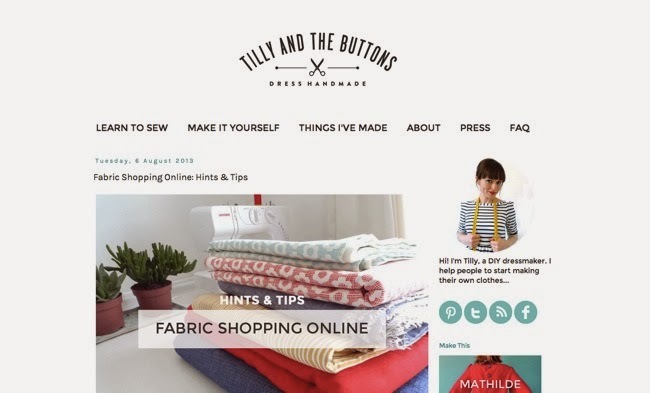 I usually try to include a piece of good content as the newsletter lead, like a project tutorial, free pattern or designer interview, so it’s something our customers look forward to receiving. Next, I met with a fabric distributor who had a surplus of gorgeous fabric he wanted to show me – normally we place orders months in advance but I was so taken with this collection of soft, textured cotton that I bought it on the spot! Finally, Caroline and I went over our schedule for preparing and shipping December’s Village Stash Society bundles – part of a stash-building club we designed for quilters. Caroline and I take turns staying late when we have evening classes or our Thursday knitting night. When it’s my turn, Ed picks up Harvey at the shop as soon as he gets off work and puts him to bed. If I’m not staying late I leave at 5pm so I can have a bit of playtime with Harvey before we start his evening routine, which involves dinner, bath and bed by 6:30pm. I read out loud to him from the New Yorker or Vanity Fair while he’s in the bath – the only time I usually have for reading! Once Harvey’s in bed I get dinner going for Ed and I, or if he’s home early enough he’ll do the cooking. Mexican food is my favourite, so we make fajitas or tacos at least once a week. After dinner it’s back to work answering emails, updating the website, writing a blog post or catching up on bookkeeping. Ed writes a popular football blog, so we can usually be found side by side on our laptops. 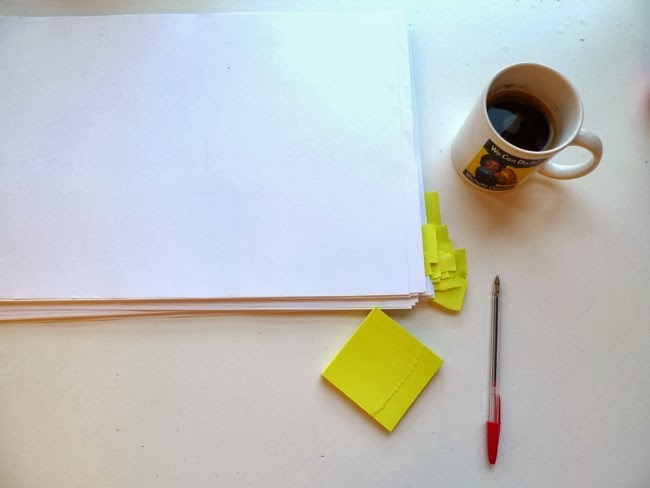 There is always more work to do but we usually try to say “tools down” around 10pm and watch a show together – Homeland, The Newsroom, Mad Men or whatever our current favourite is – with a big cup of mint tea. After that it’s bedtime and if we’re lucky Harvey doesn’t wake us up until morning!" Keep up the good work, Annie! 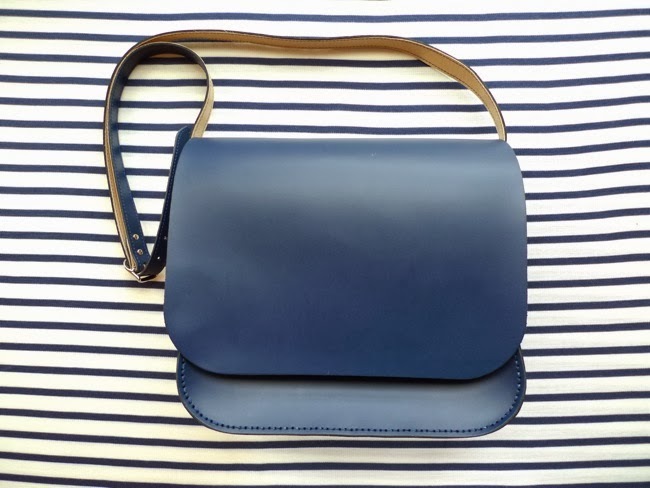 Readers, if you fancy visiting The Village Haberdashery, I'll be teaching my evening class for absolute beginners, Learn to Sew: Tilly's Bow Belt, on Thurs 16 January (only one place left so get in quick) and Thurs 27 February (just announced so should be lots of space). Hope to see you there! Finished! 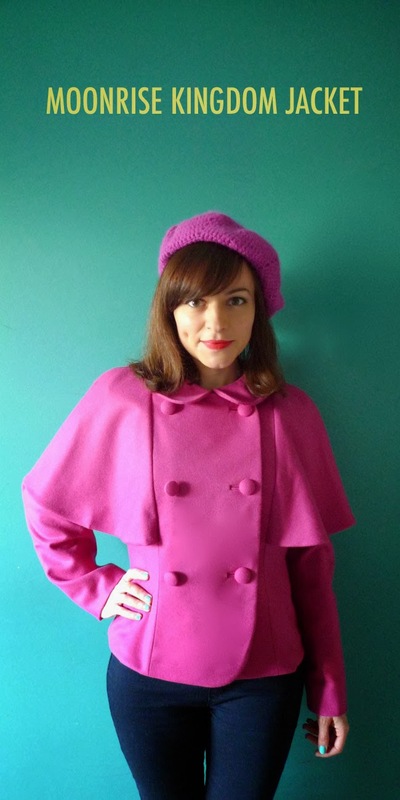 The Moonrise Kingdom jacket, inspired by Suzy Bishop's coat in the Wes Anderson movie. 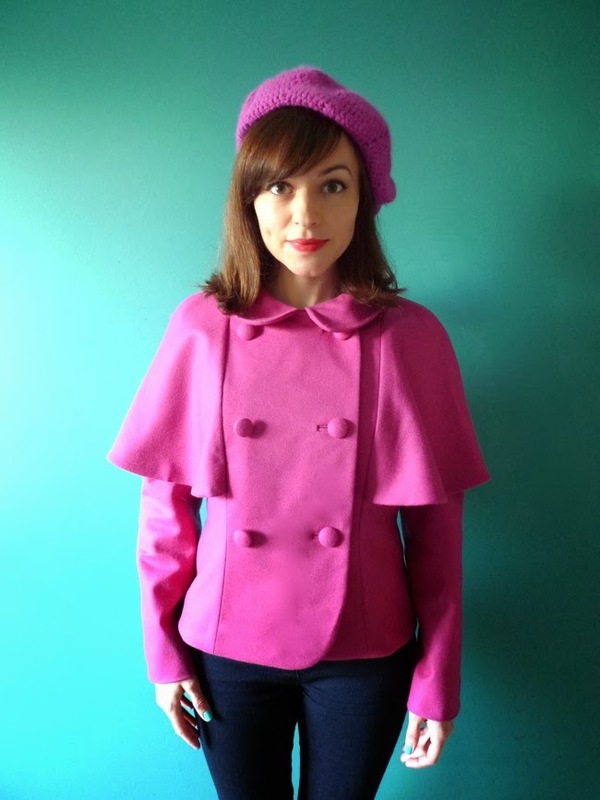 I made this from the Watson jacket sewing pattern from Papercut Patterns (available in the UK from Sewbox), using hot pink wool and houndstooth lining from Goldhawk Road. This isn't what you'd call a speedy sewing project, particularly as I decided to make fiddly bound buttonholes as well as fabric-covered buttons. I also patiently made a toile of the bodice so I could adjust the pattern to fit me (just the usual adjustments for my shape, nothing unexpected). I wish I'd toiled up the capelet (love that word) too, as the shape of the shoulder curve has ended up a little large on me. Oh well, eighties pop video here I come! 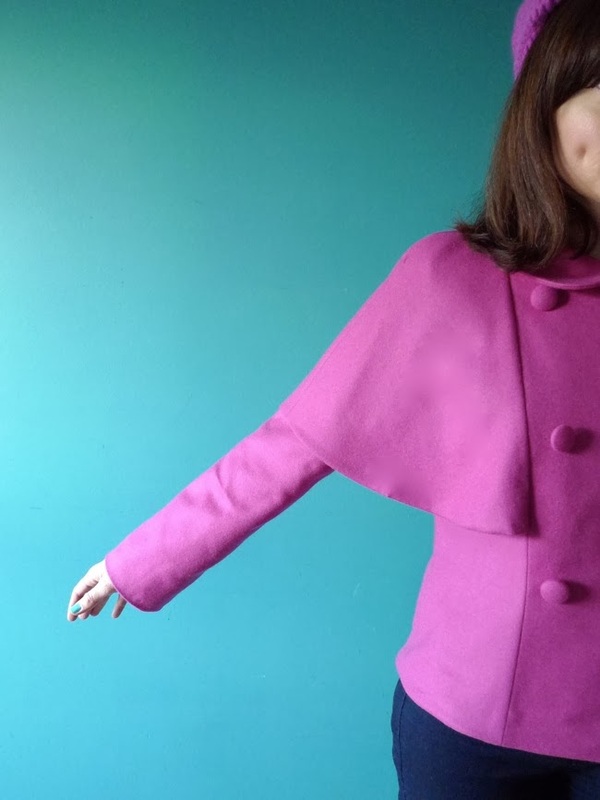 I had to unpick a couple of times as I missed or misunderstood some of the instructions, particularly with the direction of the hem facing and how to attach the capelet (still love that word) to the shoulder seams. Take extra care with these parts and baste first if you're not sure (something which I of course didn't do!). It turned out lovely in the end though so was worth the effort. 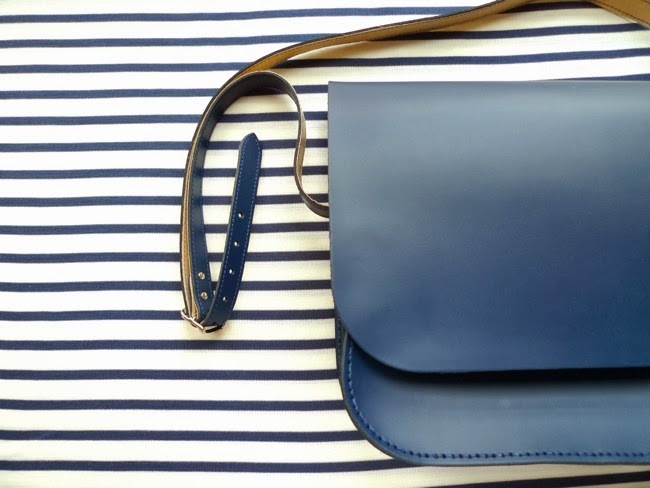 It really is a beautifully designed pattern, and I'm already dreaming about making a little navy jacket for the Spring, perhaps without the capelet this time - as swoonsome as it is, there are only so many capelets one needs in one's life, non? 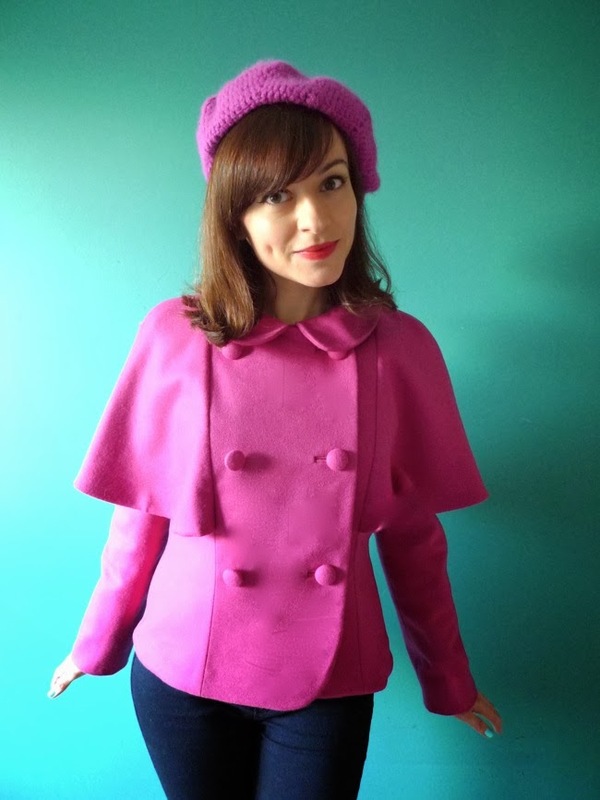 Speaking of the capelet (the more I look at the word, the weirder it looks), as you know the inspiration for my pink jacket was Moonrise Kingdom. Or was it...? The other night I turned on the telly and happened to land on an episode of Father Ted (for international readers, this is a genius sitcom about three Catholic priests and their housekeeper living on a tiny island off the coast of Ireland - much funnier than it sounds, I promise). In this particular episode, three bishops visit Craggy Island to upgrade a local holy stone to a "class 2 relic"... hilarity ensues, of course. As I was watching, I began admiring the robes worn by the priests... and they started to remind me of something... now what was it...? Yikes! 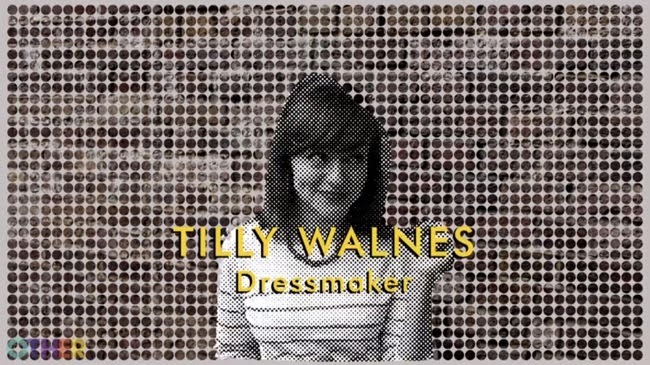 My eyes suddenly darted a few cms left of the screen to my dress form and there it was! 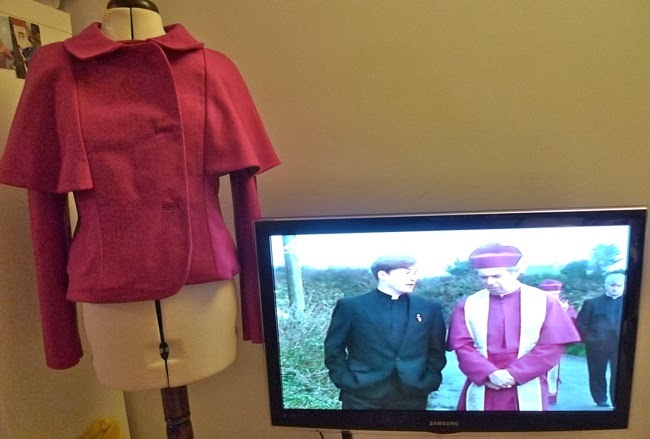 I'd inadvertently been channeling Catholic Bishop Chic through my sewing all along. Stop laughing! Can we just pretend we never noticed the uncanny similarity please? It's the Moonrise Kingdom jacket. 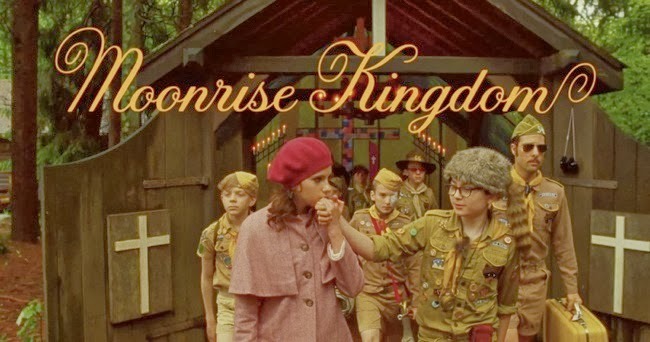 The Moonrise Kingdom jacket. Just to keep things fresh, I'm starting with a new pattern. Now, I could keep the design completely under wraps until the release date in the name of surprises. But this time I thought it might be interesting (for me as well as for you) if I pull the curtain back and blog about some of the process. As well as offering you an insight into what goes on behind the scenes on a project like this, perhaps live blogging the process will spur me on towards the finishing line! So what's the next pattern? Well... without wanting to give absolutely everything away (you still want a bit of a surprise, right?) 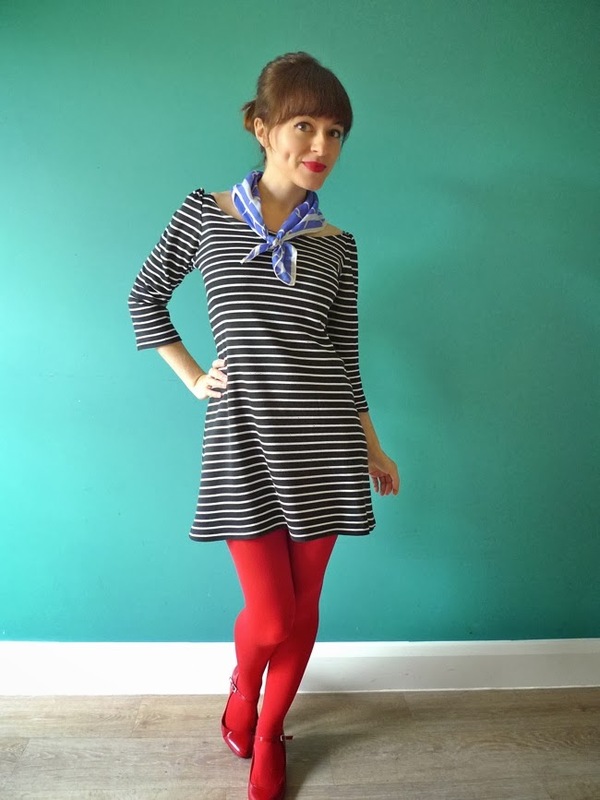 the starting point for the design was my Breton Tunic Dress, AKA the Dress I Want to Wear Every Day. 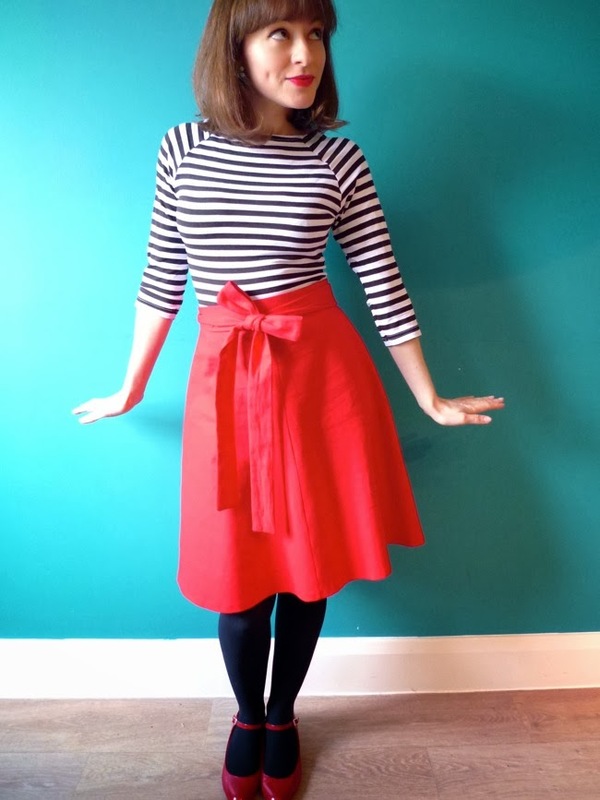 If you're a regular reader, it will come as no surprise that I've been dreaming about releasing a perfect Breton top/dress pattern, and now I'm finally doing it! Yay! 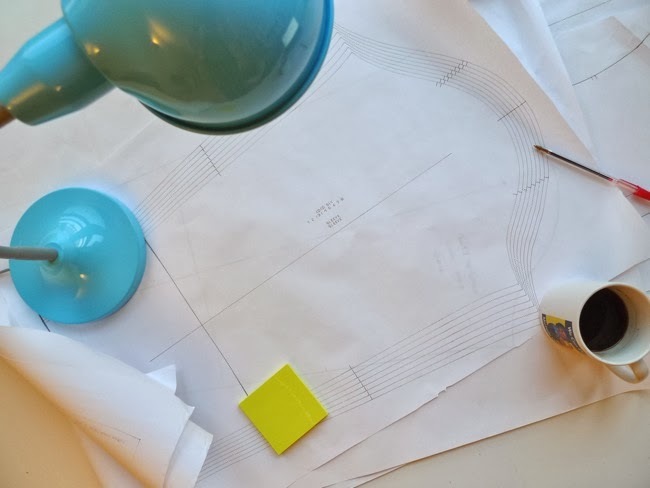 I say "starting point" since the pattern has been through various iterations since I made that dress, plus the pattern will also include some other variations which are just sooooo swoonsome... I hope you love it as much as I do! Oh yes, and the pattern is named Coco, bien sûr. As well as developing the pattern, I've been working out the format of the printed patterns, instructions and packaging. 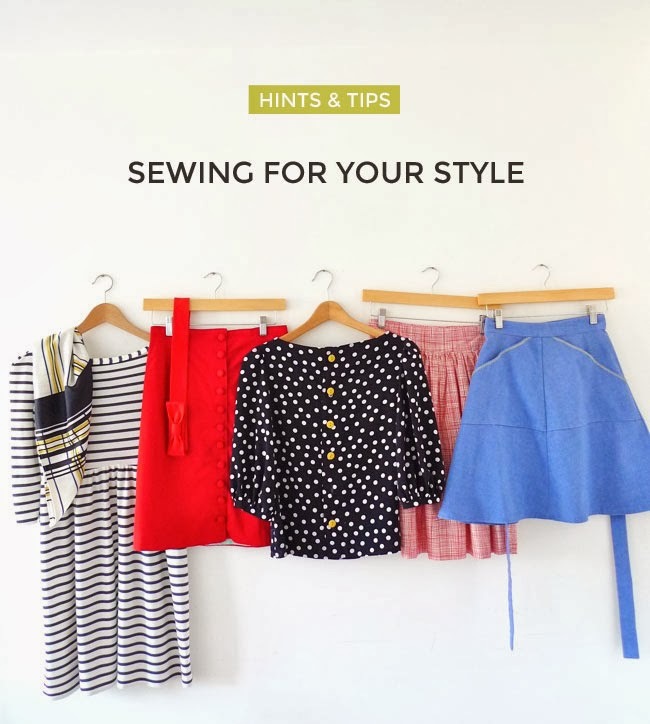 I want the printed patterns to be fresh and appealing, and it needs to be clear what the product actually is to someone who's never seen a sewing pattern before. All while keeping costs down to ensure the final price is right. Which brings me on to the business side of things. I've gone back to school! 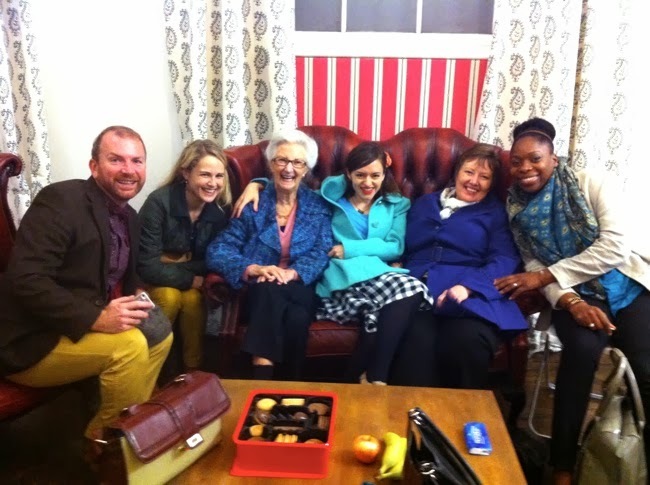 This Autumn I started the School for Creative Startups, a really amazing course led by serial Doug Richard of Dragon's Den fame. 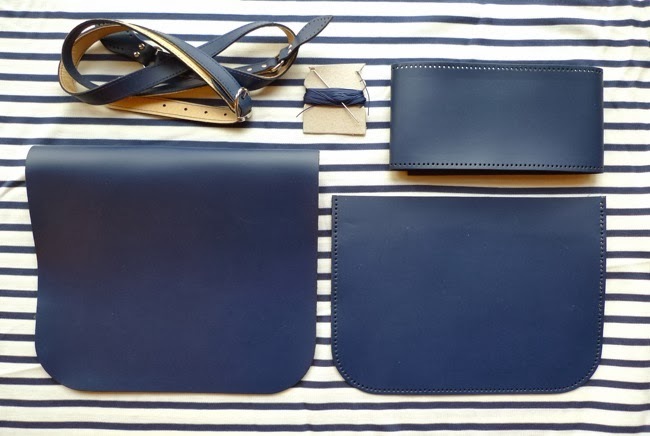 I was extremely fortunate to be awarded the HRH British Made bursary from the Duke of York to participate on the course, thanks to what I've done with this here blog. Crazy, non?! Whether Prince Andrew himself is an avid reader of T&TB is yet to be confirmed... The course has got me thinking seriously about how to ensure what I'm doing is sustainable and to grow it for the future. 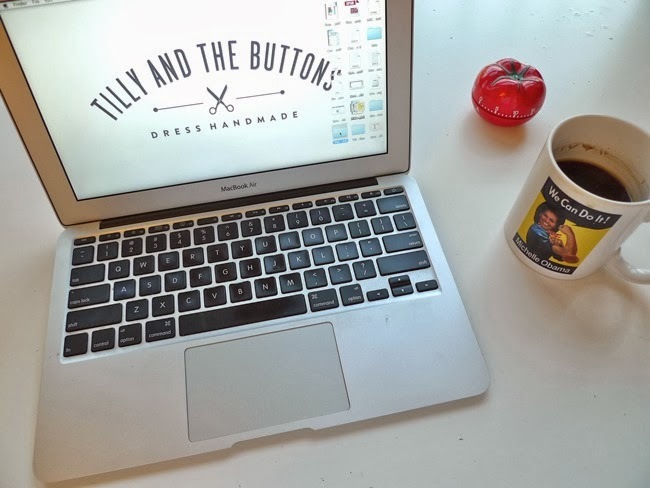 My dream is to one day be running T&TB from a bright and colourful office-studio and to employ collaborators to work with me... wouldn't that be amazing? It may just be a dream for now, but life is too short not to try to realise your dreams, so it's a goal I'm actively working towards. In the meantime, I'm getting my head around business legislation, cash flows, distribution... so much to think about! 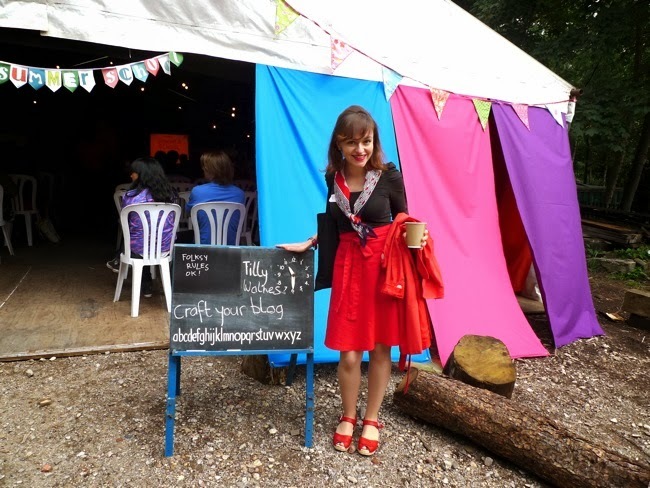 Now that I'm a full time... erm... blogger-author-designer-teacher-entrepreneur, I'll probably start sharing more of what's going on behind the scenes. Personally I love reading those kinds of posts on other blogs by women who are their own bosses (such as Tasia), so hopefully some of you might find it interesting too. Plus it'll be good for me to pause and reflect on how things are going - if a little daunting posting it all on the internet, so be gentle, y'all! If you have any questions about how I do what I do, post them below and I'll see if I can cover them in future posts. In the meantime, wish me luck! "Oh my gosh, so many lovely things! I wouldn't even know how to deal with all that loveliness! I have so many fabrics from Minerva on my wish list so I could get some of those and then treat myself to some Liberty fabric too. (Again, so many to choose from!!) 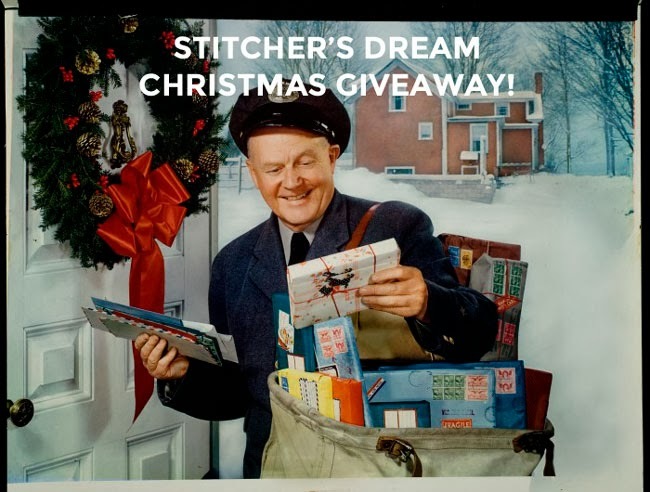 Thanks Tilly for hosting such a great giveaway!!" Wooooooop! Congratulations, makesphere, aka Courtney! 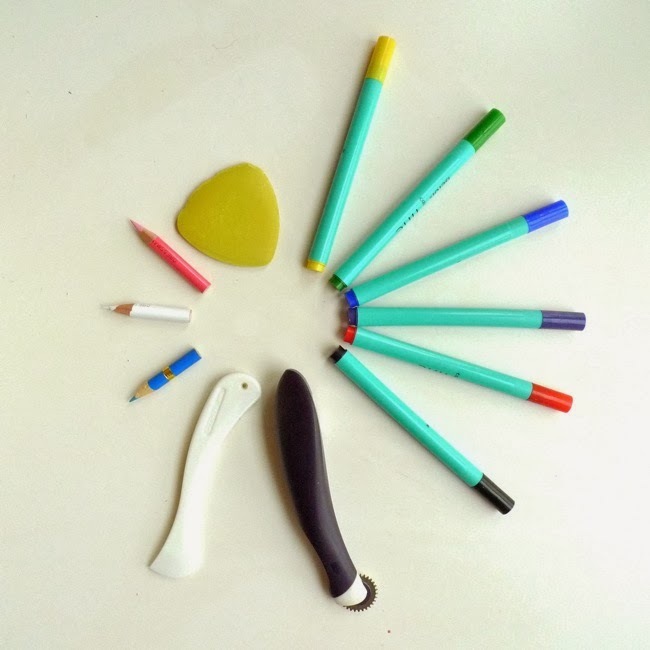 I'll be in touch to arrange getting your prizes to you. I hope you have lots and lots of fun choosing your winnings and using it to make lots of lovely things. Do come back and show us what you've made!